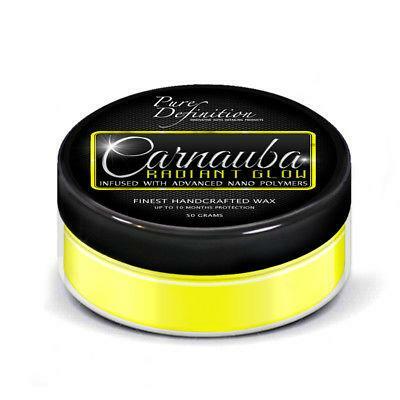 Carnauba Radiant Glow is the result of over two years research and development into creating one of the finest handcrafted paste waxes. The colour, clarity and true beauty of the paintwork is intensified and enriched, while additionally offering superior paintwork protection against an extensive range of potential paintwork contaminants. To finish of the finely handcrafted Carnauba Radiant Glow paste wax, it is perfectly scented with a sweet ripe cherry fragrance. Carnauba Radiant Glow is developed to create the ultimate finish and paintwork protection, handcrafted with a sophisticated blend of top-secret ingredients for optimum results. The carnauba wax provides the signature radiant glow, producing exceptional paintwork gloss and depth. The innovative advanced nano polymers offer extreme paintwork protection and durability for up to 10 months. Carnauba Radiant Glow will protect and withstand against all environmental conditions such as, rain, snow and UV radiation, which would cause fading and discoloration if not protected against. Once a layer of Carnauba Luminous Gloss has been applied onto your paintwork, within approximately 20 minutes it will transform into a rock hard protective layer. The protective layer locks in the colour, depth and clarity enhancers which are infused in the wax to create the unique and complex carnauba radiant glow formulation.